A cursory glance at the September/October issue of Antiques Magazine confirms that fall heralds good hunting for antique lovers. Heirloom treasures abound at the International Show at Park Avenue Armory, Fall Antiques at Rhinebeck, Boston International Fine Art Show, Deerfield Antiques Show, Delaware Antiques Show, Philadelphia Antiques & Art Show, Shenandoah Antique Expo, Natchez Antique Forum, Louisiana Purchase Auction, Houston Antiques & Art & Design, San Francisco Fall Antiques Show, and that’s just the tip of the iceberg. Whew! I’m pooped already. 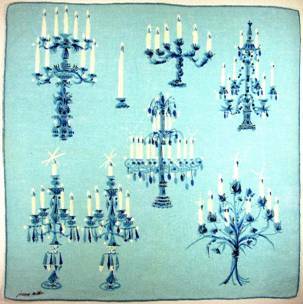 A favorite haunt for collectors of Americana and American furniture has always been the east coast, where skilled European craftsmen settled in the colonies to ply their trade – everyone from silversmith Paul Revere to Scottish cabinetmaker Thomas Affleck, famed for his Chippendale furniture, to hundreds more. 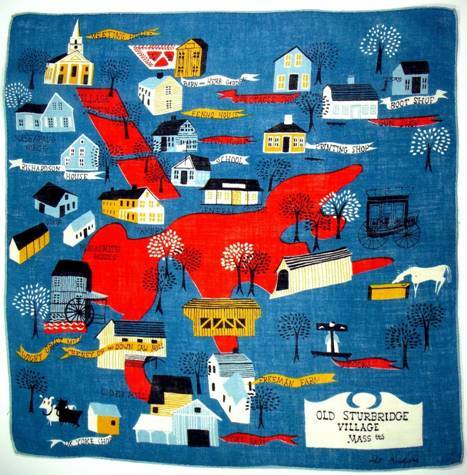 A trek through quaint towns and country barns is bound to unearth a treasure or two. 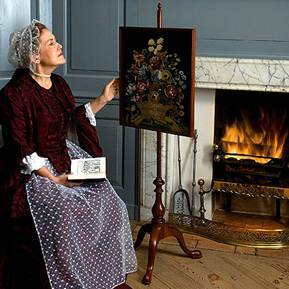 Simple early American and Shaker style furniture – ladder back chairs, spinning wheels, rocking chairs and sewing tables remind us of a paradoxical time when life was much simpler, but work was never done. 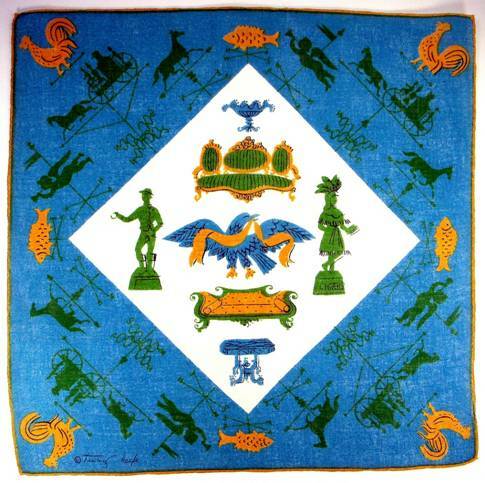 As we discovered in Antique Signs the weathervane is a perennially popular and regularly coveted accessory. 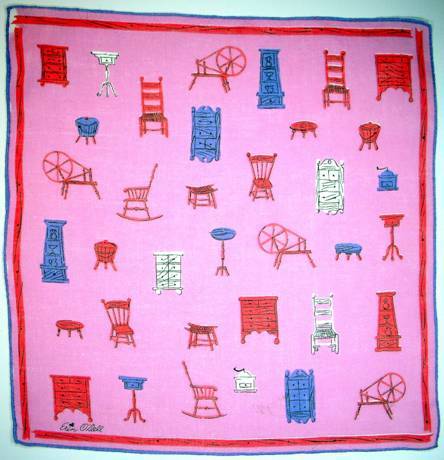 This fanciful border of one of a kind “lady chairs” is reminiscent of adolescents queueing at a tea dance in hopes that a shy beau will approach and ask for a waltz. They’re oh-so-dainty, and humorously chaperoned by fatherly corner chairs anchoring each corner. The Staffordshire dogs, oil lamps, and candy jar are de rigueur accoutrements for a Victorian parlor. 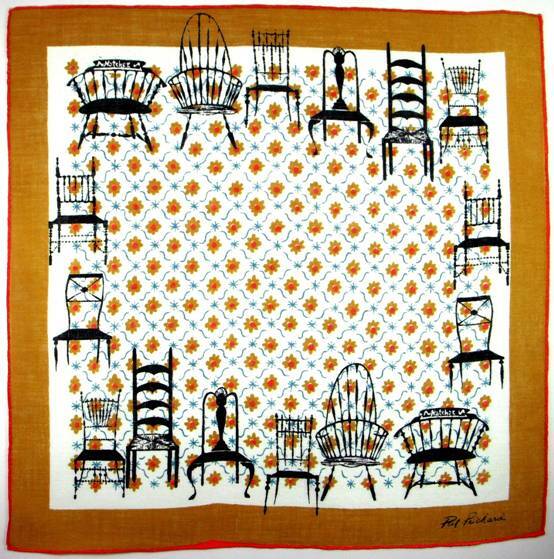 From Pilgrim Carver to Queen Anne, Pilgrim slat back to bow-back Windsor, these handsome chairs set against a calico backdrop make you want to pull one close to the fire to work on your sampler, or spend the evening discussing politics with the founding fathers. 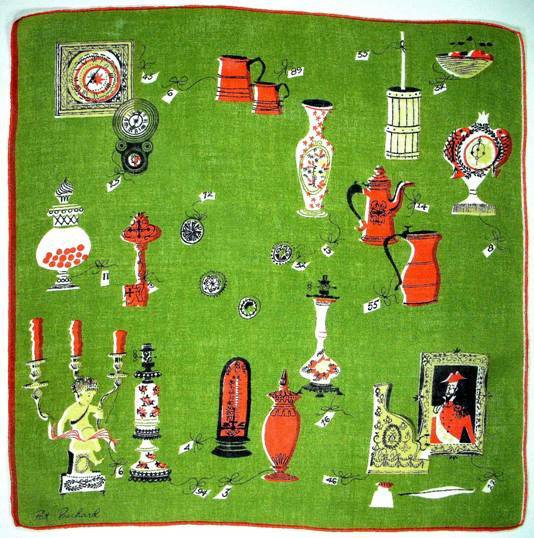 This hankie has it all – from Pennsylvania Dutch wedding chest to pepper grinder to powder horn. The tiny price tags confirm we’re not in a museum, but scouting with a gimlet eye at the local flea market, boot sale or antique stall. More goodies at the tag sale. 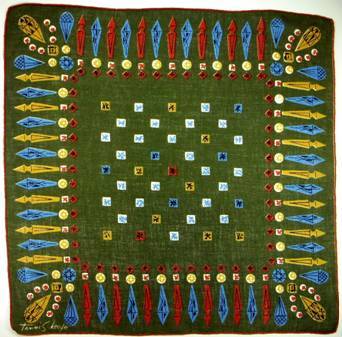 The little circles in the center are millefiori paperweights which you saw in our blog on correspondence. If the cherub candelabra above is a bit over the top for your tastes, perhaps you’d prefer a classic brass tower, or candlesticks adorned with crystal prisms to catch and reflect the light. Prisms abound in antique shops, whether on chandeliers, candelabra, wall sconces or hurricane lamps. 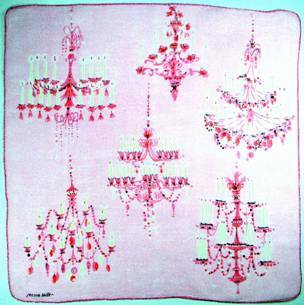 Nothing is prettier by candlelight, casting rainbow hued beams on both ceiling and walls.This prism-bordered hankie pays homage to the crystal light catchers. As we’ve said before, collect long enough, and you’re bound to find a handkerchief on every subject! Were I to greatly enlarge the yellow hankie below, you would discover that the hanging ceiling lamps are adorned with teeny prisms. All manner of timepieces and lamps entice shoppers in the hankie on the left, while on the right furniture galore tempts and tantalizes at the local auction house. More tabletop treasures from birds under glass to marble busts to ships in a bottle, and on it goes. What’s interesting about these Keefe creations is that she captures the feeling of both overwhelm at the abundance of choices, and palm rubbing sleuthing to ferret out the single gem. Treasure hunting can be so daunting, we’re grateful that the artists featured here – Prichard, Keefe, Miller – employed a limited color palette so as not to overwhelm the viewer. 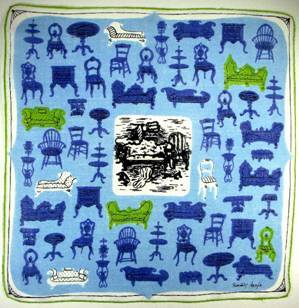 In addition, Keefe confined a single category to each hankie – furniture, clocks, etc. You might assume decreasing the number of images would be easier on the eye, yet take a gander at the hankie below. Although fewer in number, the objects are so varied, it feels like an actual antique mall, where endless options assaults the senses, thus we’re grateful for the restful color scheme. 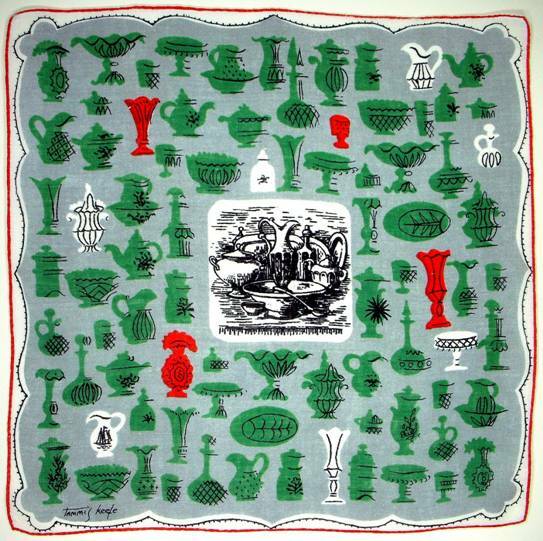 I love everything about this hankie – the subject matter, the color scheme, the images. 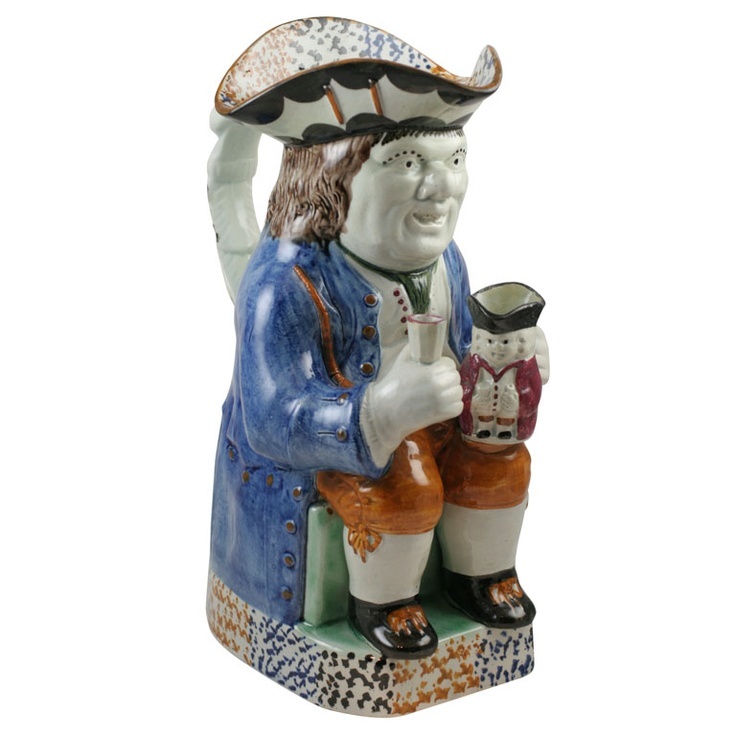 From tankards to goblets, pitchers to Toby jugs – it’s time to hit the tavern and raise a toast. 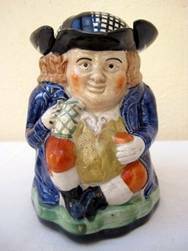 According to some reports, the original toby jug was named after Toby Fillpot, a character in the song Little Brown Jug, popular in England in the 1700s. Originally, the tri-cornered hat was removed and used as a cup. A true Toby depicts a full form seated or standing, as opposed to just a character’s head. 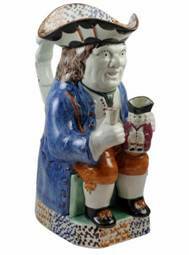 So popular were the little jugs, that at one time, there were over 200 manufacturers creating them. 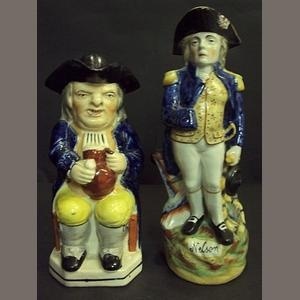 Below, the jovial dimpled man on the left has his own little toby resting on his knee. Too cute! 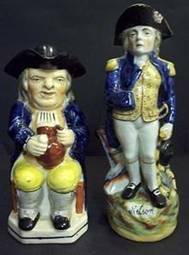 The standing Toby in the middle represents the great naval hero Admiral Horatio Nelson. The toby on the right has a removable hat. What would Antiques Road Show be without a toy bank or two? 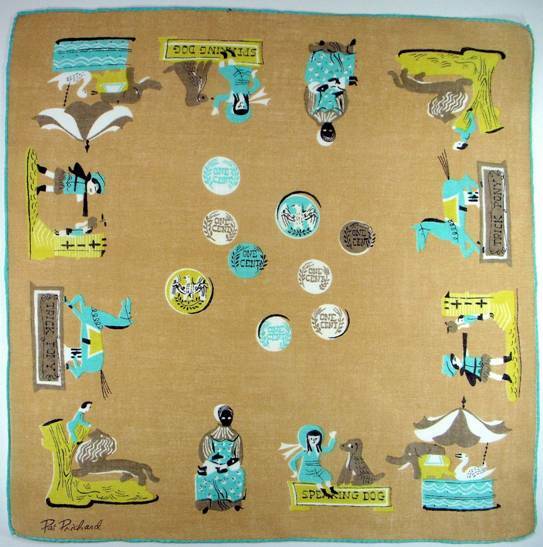 These next hankies illustrate a variety of antique banks that today would be prized collectibles. The first one includes a man feeding a lion, a trick pony, a carousel, a mother and child, a speaking dog, and William Tell shooting an apple off his son’s head! 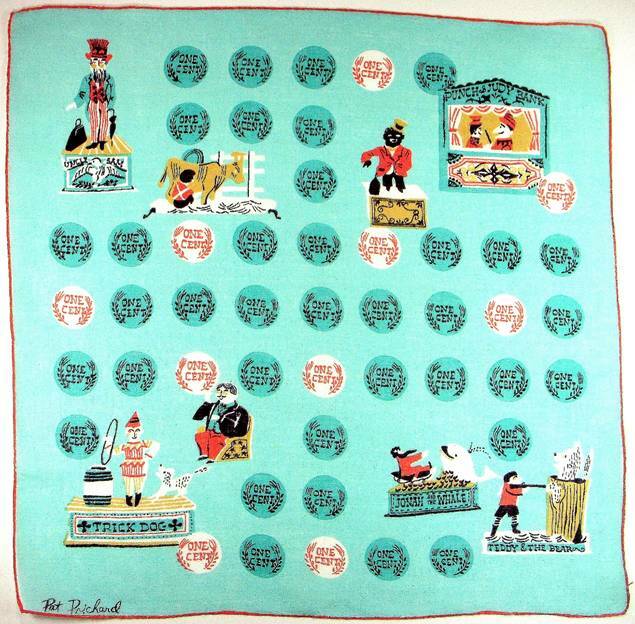 A backdrop of colorful coins sets a festive mood for this cheerful gathering of Punch and Judy, Uncle Sam, a boy milking a cow, a carnival barker, a trick dog, Jonah and the Whale and Teddy and the Bear. Ben Franklin would be proud. Not only is a penny saved a penny earned, saving is fun in the bargain. The setting: It’s 1892, and an important art auction is underway at the Hotel Drouet in Paris. Item #31 – The Concert by Johannes Vermeer is up for bid. 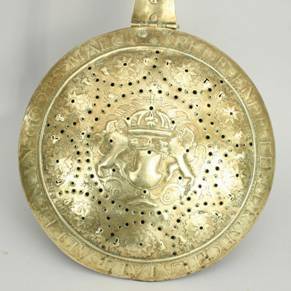 Three bidders are vying for the prize – the Louve, the National Gallery in London, and an unidentified bidder, represented by an agent. The gavel falls, and the winning bid is $29,000, far lower than anticipated. The Backstory: Both the Louve and the National Gallery assumed the agent was bidding for another museum. At that time, it was considered bad manners for museums to bid the price up against one other, since each had limited funds for new acquisitions. 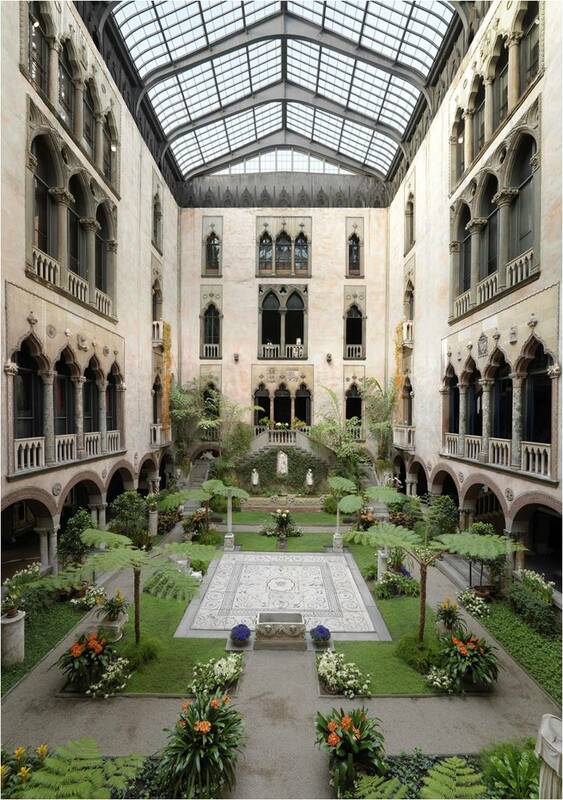 Soon the Vermeer was on its way to Boston and its new owner – private collector Isabella Stewart Gardner. 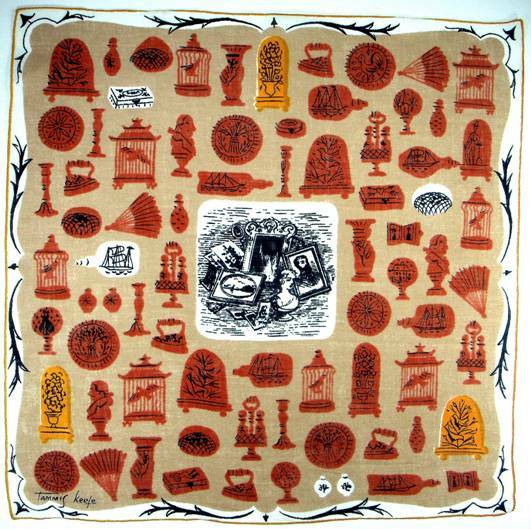 Hankie hijinks: Gardner was present at the Paris auction, sitting unobtrusively with a delicate lace handkerchief held demurely to her face. 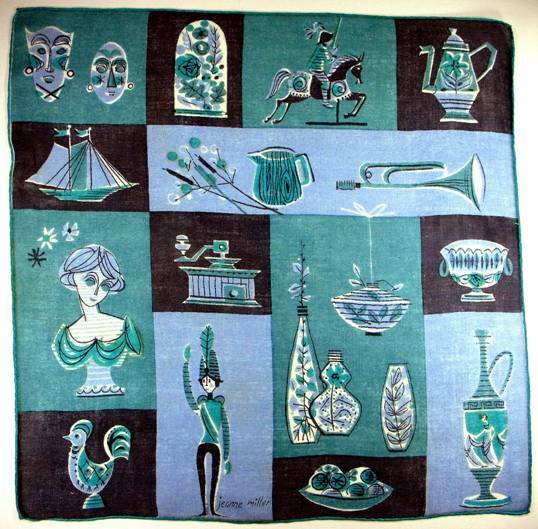 She had prearranged with her agent to continue bidding as long as she held the handkerchief up. 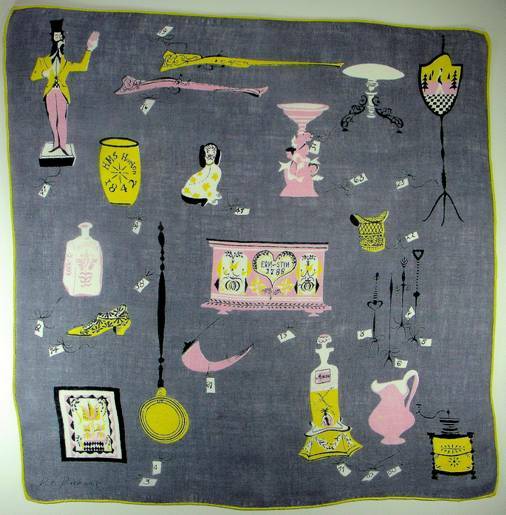 If she lowered the handkerchief, that was the signal to stop bidding. 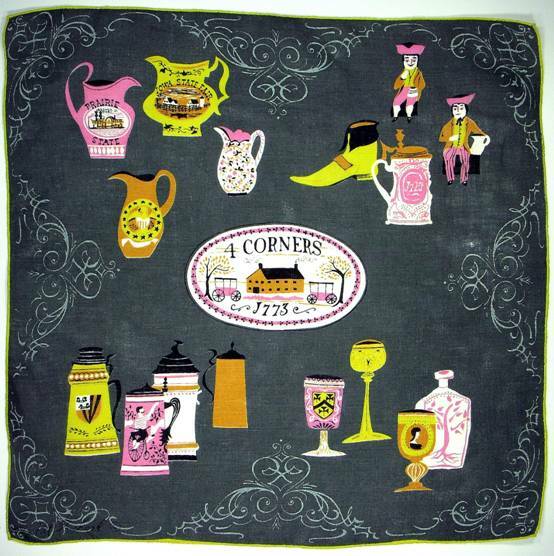 Oh those wily women and their dainty hankies! 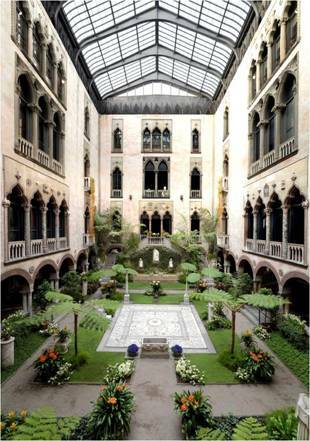 If the name Isabella Stewart Gardner rings a bell, the Gardner museum was the victim of one of the most famous art heists in history. On March 18, 1990, two men disguised as policemen appeared at the museum, stating they were responding to a call, and were allowed to enter through the security door. They stole thirteen pieces of art including works by Rembrandt, Degas, Manet, and…surprise! The Concert by Vermeer – the painting purchased with the help of a hankie. Perhaps that wasn’t such a wily move after all… None of the works has ever been recovered. There are a gazillion books on antiques, appraisal values, etc. that have sprung directly or indirectly from the show. My favorite, however, has to be Hidden Treasures: Searching for Masterpieces of American Furniture, by twin brothers Leigh and Leslie Keno. It’s no exaggeration to say their stories will astound you. Each chapter reads like a mini-mystery, so I won’t give them away. Okay – just one, because it happened in my town of San Francisco. A marble top pier table was purchased at a consignment shop for $1,500. Later, the new owner decided to sell the piece and contacted both Christie’s and Sothebys. Through extensive research, the Keno brothers learned the exact same table had originally sold at auction in 1990 for $170,000. Yikes! What happened? Their research unearth a startling story. The previous owner had hired an interior decorator to “re-do” their place. 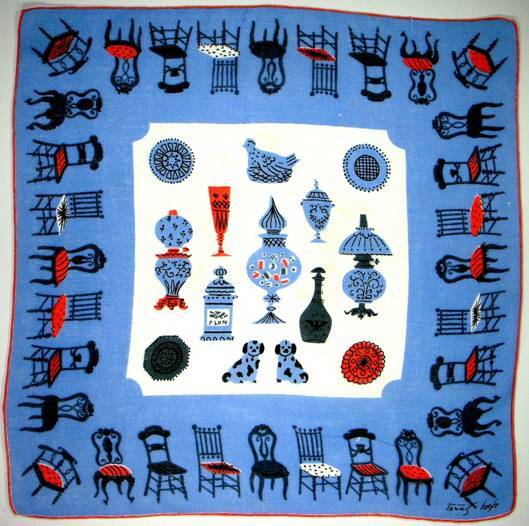 In an effort to “start fresh”, the decorator “cleared out the client’s former furnishings and sent them to a consignment shop!” Now, here comes the kicker – after careful appraisal (the book delineates the details) the table sold at auction in 1998 for (gasp) $882,500. 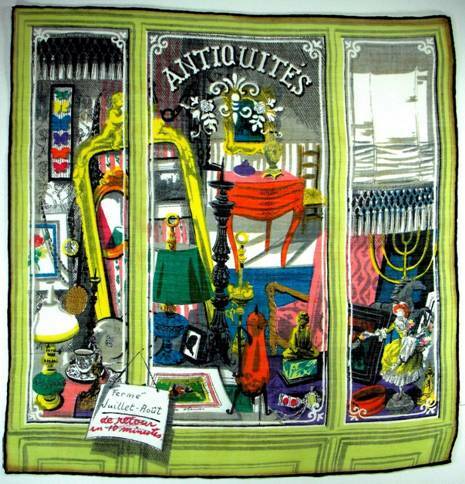 Whether you’re an antique aficionado or not, the book is a great read. Another book you may enjoy which follows the trials, tribulations and travels of three pieces of furniture, is Objects of Desire by Thatcher Freund. The pieces include a pine blanket chest, a Chippendale card table and a Federal inlaid sofa table. The story line is structured in flashbacks to the 18th century as we follow these objects through the lives of their various owners. For those of you starting to yawn – trust me, each item has such a backstory, you’ll be on the edge of your seat as you get caught up in their journeys, and hope each one will find the perfect owner. You come to understand each piece has a history as real as any living person. This gem of a show combines the adventure of treasure hunting, with history, art appreciation, family stories and more. It’s a feast for the eyes and the heart. Perhaps that’s why it was fun to see Kevin Bacon in a public service announcement for PBS declaring Antiques Road Show was his favorite show. As far as “six degrees” of Kevin Bacon, that’s about as close as I’ll ever get, I’m afraid. Once again your blog was even more than I hoped for and far exceeded my imagination. I love the depth and breadth that you go to for each topic. 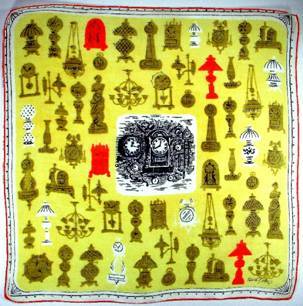 Hankies are quickly disappearing off of the scene and hopefully this will cause them to become more precious. Thank you for your supreme effort.